Location: Rochechouart, in the Haute-Vienne departement of France (Limousin Region). Notes: Château de Rochechouart is a castle located in the Aquitaine-Limousin-Poitou-Charentes (Haute-Vienne), in the historic Limousin, above the confluence of the Seed and Vayres, originally built in the twelfth century and which also includes parts of the fifteenth century. The dynasty of the viscounts of Rochechouart was the owner of the establishment of the castle to its sale to the French state in the nineteenth century. Rochechouart Castle now houses a regional museum of contemporary art and local services of general council of the high comes.The castle's history begins around the year 1000 by the fortification of the viscounts of Limoges a rocky outcrop overlooking the Grain.The castle, whose keep dates from the twelfth century, and the majority of the fifteenth century building is located above the confluence of the seed and the Vayres in the town of Rochechouart.Until 1470 the manor is the stronghold of a younger branch of the viscounts of Limoges. The ancient fortress there remains only the gatehouse with drawbridge that preserves one of the towers of the thirteenth century.During the Revolution, attempts to demolish the castle. 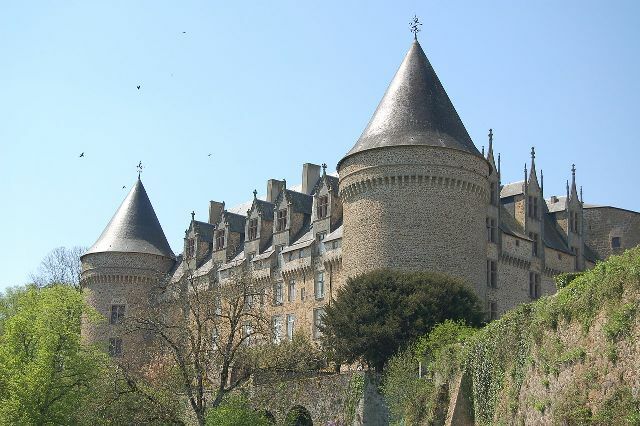 The revolutionaries succeeded only demolish the top of the two towers that flank the southeast façade.The castle was bought by the department in 1836, during the reign of Louis Philippe. He began his identical restoration.Between 1858 and 1859, the early restoration campaigns is conducted by the department of Historical Monuments to install in the castle the sub-prefecture and town hall, in the reign of Napoleon III. Today, it houses since 1985 the Museum of Contemporary Art of Rochechouart where you can admire the bottom Raoul Hausmann, Dadaist artist, and works of international artists of the 60s to the present, such as Giuseppe Penone, Arte Povera, Christian Boltanski or Tony Cragg. We can also see collections of flint, axes, cut and polished stones, bones of prehistoric times, reconstructions of hypocausts from Chassenon, pottery discoveries in Auvergne and Charente.